Revived plans for a seven-storey office and apartment block next to a city arts and music venue are facing opposition. Developers who brought an old tram depot in Grangetown, Cardiff, back into use are behind the latest scheme. 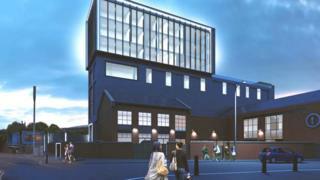 It was put on hold 18 months ago amid objections from people including the operators of the Tramshed arts venue. Grangetown councillor Ashley Lister said the new venue had been welcomed but claimed over-development of the site would lead to its "detriment". The new building is planned for vacant land alongside the arts centre, with 28 apartments and two floors of office space. Councillor Lister, a member of the ruling Labour group, said: "We're going to have dispersal issues in Grangetown at the end of gigs. "All in all I think they have a really good community venue," he told the Local Democracy Reporting Service. "Adding anything of this scale is going to lead to the detriment of that project." Fellow Grangetown Labour councillor Lynda Thorne - the cabinet member for housing and communities - is also opposed to the scheme. When the plans were first revealed in 2017, the Tramshed operators expressed concerns over where tour buses and trucks would park once the block was built. Building works causing "significant business interruption" would "make the Tramshed not viable for us to continue", they added at the time. In an updated application, TS Developments claimed the height of the block was "appropriate" due to its location alongside the main south Wales railway line and near other tall buildings. "The concept is for a building that has a sympathy and harmony to the Tramshed in tone and material, but that is at the same time distinct and has its own design integrity," the firm added.